I wanted to take a few moments to talk about what I really enjoyed about the DOCTOR WHO finale, “The End of Time.” I fear my last piece might have looked a bit too negative, since it focused a lot on…well, the negative. 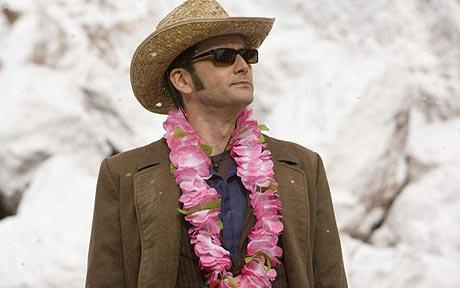 But there was plenty to enjoy about David Tennant‘s swan song – especially the star himself. It is impossible to underestimate the value of Tennant to the franchise. He is an enormously charismatic actor. When you think about it, the 10th Doctor could be seen as an overgrown, hyperactive child – constantly in motion and chattering. Tennant never settled for merely reciting a line when he could shout it while breathlessly running in circles. And I was totally fine with that, because Tennant made it charming rather than annoying. He is a very capable actor. Whenever the scripts gave Tennant a chance, he always sank his teeth into the quieter moments, and imbued his character with a melancholy almost as powerful as his mania. It is largely due to his performances that the image of the Doctor as a lonely god is so firmly etched in the public’s mind. True, Sylvester McCoy‘s brilliant personification of the Seventh Doctor was largely responsible this character element, but the loneliness was not played up nearly as much in seasons 25 and 26 as it was in this year’s 10th Doctor specials.